Where Roots And Wings Entwine: Lil' Ocean Explorers. Having loved renowned, multi-national children’s toy manufacturer Little Tikes for a number of years now from when Bug was a baby, it was only natural that when we had Jelly Bean that we would keep an eye out for Little Tikes toys for him too. As we love Little Tikes and want Jelly Bean to enjoy the high quality, durable and engaging children’s products they make we were delighted to hear about their new range of toys. Lil’ Ocean Explorers is the new range of Little Tikes toys that as well as being made for lots of fun are designed to help develop the motor skills, confidence and coordination of little adventurers. With an ocean theme the new range consists of 8 adorable sea creatures, all of which are designed to help little adventurers discover, learn and have fun. 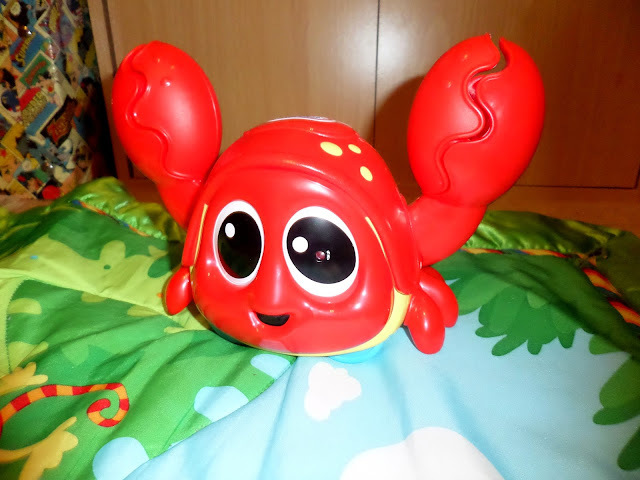 The Catch Me Crabbie is a colourful, friendly crab that is lots of fun. Thanks to motion sensors that detect when baby is near, the clackin’ crustacean moves from side to side clapping its claws and playing music when the crab senses baby is getting close. To get crabbie moving you press the top of his head then when he senses baby getting close he shuffles off and claps his claws, enticing baby to chase him. The crab’s clever design means that not only does the crab move and clap, but he is a tricky crab who changes direction mid move so that you cannot predict exactly which way he will go, keeping little ones on their toes! Jelly Bean loves the bright red crab, with his new crabby friend being his favourite ocean friend from the bunch of new toys. He gets all excited at the sight of crabbie moving side to side to the music, clapping his claws as he goes. Whilst Jelly Bean is not quite on the move yet, I know that once he is moving he will love chasing his fun and interactive little friend and until then crabbie is encouraging him to learn to crawl as he Jelly Bean tries his best to crawl and chase him, and when that fails he rolls and shuffles along the floor instead chasing crabbie down! 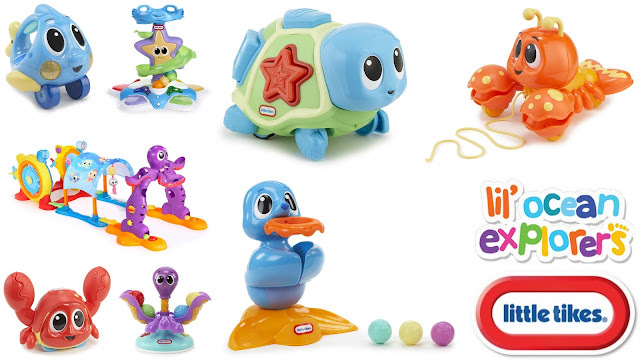 Little Tikes have given shape sorting toys a Turtle twist with the Crawl n’ Pop Turtle designed for little ones 6+ months. 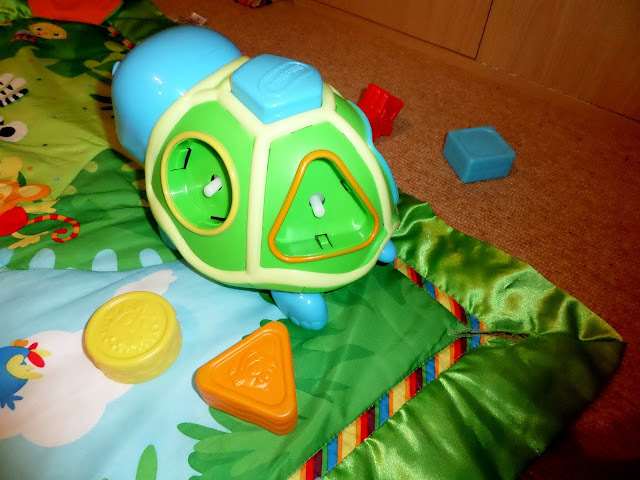 As well as being a way for little ones to learn about shapes and colours by placing the colourful, chunky blocks into the Turtle’s shell, the Turtle can also move! To make him move you simply press the button on the top of his colourful shell. 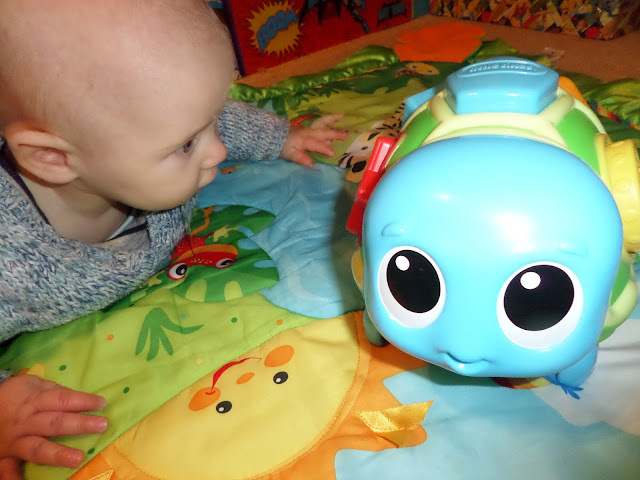 Zig zagging along to upbeat music the Turtle moves along the floor which is ideal for encouraging little ones to move and crawl. 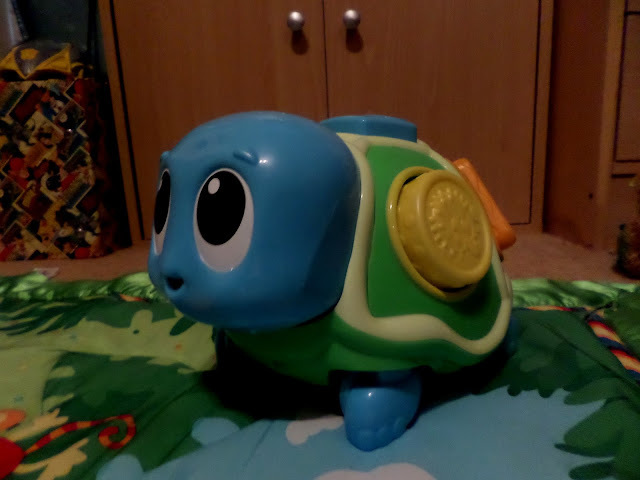 The Turtle has a lovely surprise to show baby, once it has gone for a little walk the Turtle stops and the blocks POP! Out of the shell ready for baby to place in again for more play and fun. The Turtle is a cute little creature that has a lovely friendly smile on his face. When he shuffles along the floor and then POP’s the shapes from his shell Jelly Bean smiles with delight. Whilst Jelly Bean has yet crawl after turtle and place the shapes back in his shell, he finds his Turtle friend amusing and loves to hold and play with the chunky shapes. 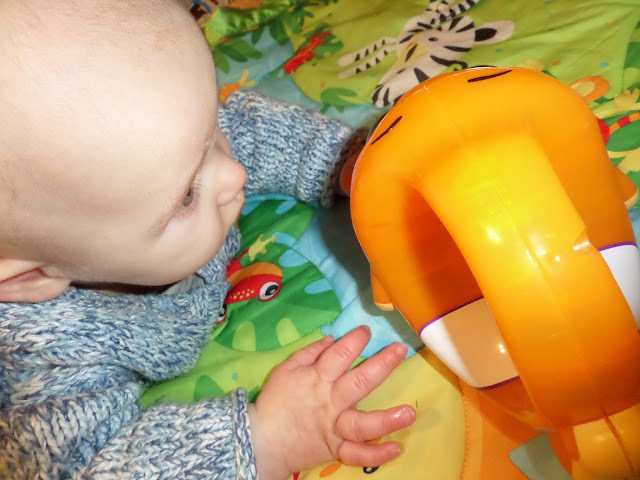 I love that the Turtle is chunky and durable, and that as well as being fun and entertaining for little ones it also has educational benefits helping little ones learn about shapes and colours as they sort the shapes. I also appreciate the fact that as well as encouraging little ones to move and help gross motor skills, playing with the Turtle also helps hand-eye co-ordination. 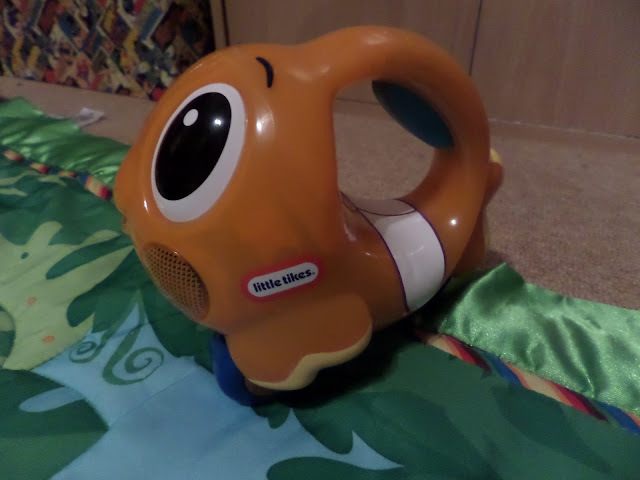 The colourful and friendly fish comes with fun sounds, a light-up feature and an easy to hold handle that allows for little ones to push their little fishy friend along the ground. Jelly Bean loves the bright orange fish especially when he is glowing brightly. To help his fishy friend glow you simply press the button under the carry handle. The fish is a great size for little ones and the handle is ideal for little hands to hold. I also like that the as well as being well-made the fish is very durable which is great for long lasting play. 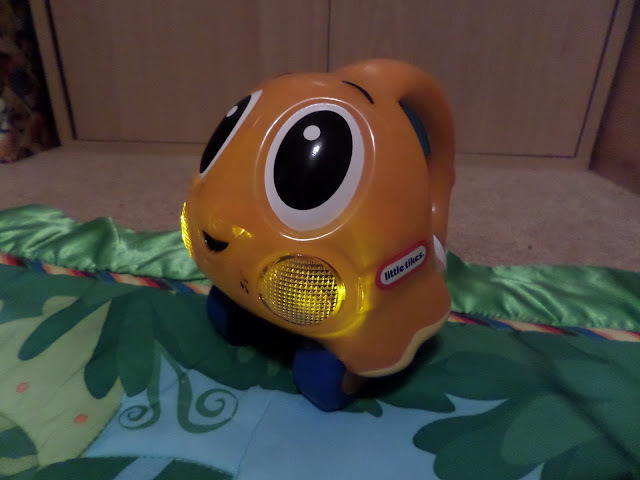 At the moment Jelly Bean has only played with his new fish friend by holding him, playing with his glowing light and trying to eat him, but I know that in the very near future he will also be pushing him around along the floor…..most probably getting his fish friend to help him catch the crabbie! To promote the benefits of the range of Lil’ Ocean Explorers toys, independent play expert Dr. Amanda is working with Little Tikes over the next 12 months via microsite content, Facebook chat on the Little Tikes Facebook page and live Twitter chat with Loved By Parents. 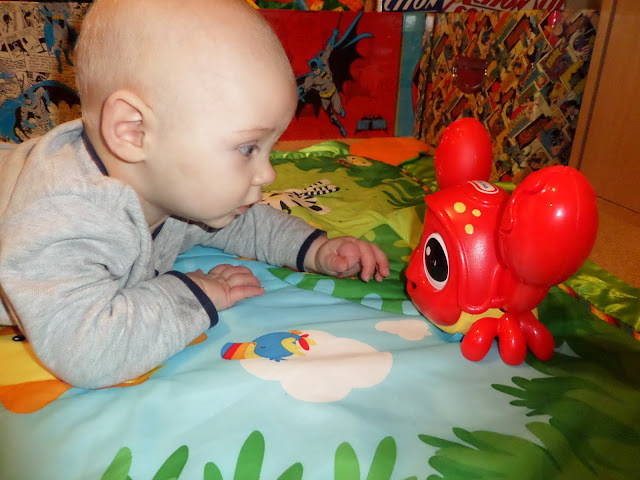 Like Bug before him, Jelly Bean is a fan of Little Tikes and loves his new sea creature friends which are helping him learn and develop his skills all whilst having fun! The sea friends from the Lil’ Ocean Explorers range are firm family friends that I am sure will be enjoyed for a long time to come. I can’t wait see Jelly Bean enjoy other Little Tikes toys over the years and embrace their durable and vibrant children’s products that will help him learn, get active, express his imagination and simply have fun as he plays. I am especially excited about getting him a Little Trike which will not only be lots of fun when playing outdoors and going on family adventures but also make the school run a lot more fun and interesting for him. To find out more about the other sea creatures in the new Lil’ Ocean Explorers range check out the Little Tikes website. Little Tikes are classics that you can trust. I love the look of this little crab. I love the idea that it would get your little one crawling and he has such a cute little expression and massive eyes. This range is fab although we've yet to buy anything from it as yet. Love the little crab. Joseph has the top 2 that you've got as well as the Pull ‘Chatter Lobster too. He loves the crab and will regularly chase it around the room whilst trying to eat one of its claws!